A bird in the bath is the soul of enjoyment. The sight of it, even a chance glimpse through the window, will provide you too with a splash of happiness. 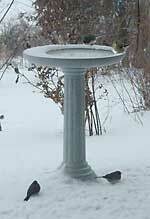 For anyone who wants a spraying fountain for the birds, with no hoses or electric cords — consider the Solar Spa Birdbath. Sunlight powers a hidden pump. This is by far the handsomest solar powered bath we've ever seen. It looks like natural stone, with a nice big 2" deep,18" wide basin. 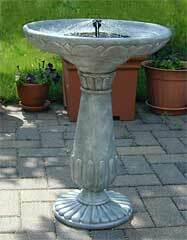 This is more than a birdbath. It's a beautiful focal point of the garden! 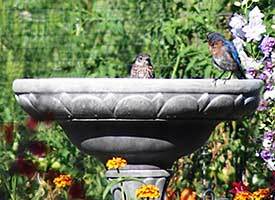 Here's a review comparing the Solar Spa to another solar birdbath. This is a pretty bath, made of hand-painted glass. Use it as a centerpiece on a patio table (tabletop birdbath scroll stand available separately), or place it on the ground. A generous-sized metal bath with a copper finish is an elegant garden ornament. Comes with a black stand. This is a long-time favorite. When summer's over, plug it in for low heat from below, and it will keep the water unfrozen through the winter. 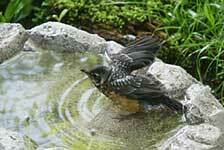 At the top of the main story is a picture of this bath in summer, with a baby robin bathing in it.